If you didn’t already know, TSA has a program, TSA Cares, for individuals in need of passenger support. Travelers can contact TSA 72 hours prior to traveling and a Passenger Support Specialist will be assigned to them to provide on-the-spot assistance. The following link has the email and phone number: https://www.tsa.gov/travel/passenger-support. 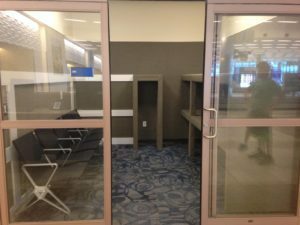 The Quiet Room, Room #171, at the Myrtle Beach International Airport is located in the baggage claim area. Although the lights are off, to conserve energy, the room is open and lights turn on when they sense movement. This space allows a safe and fun environment for kids to decompress with a caregiver while someone retrieves the baggage and rental car. If you have any issues or needs, the Airport Ambassadors are there to assist you or you can call 843-839-7372.